Imagine walking through our Halewood Press Shop barefoot. Or lifting heavy machinery or building materials across a building site in just a pair of open-toed sandals? It’s unthinkable to us but sadly it is happening every day in parts of Africa and particularly Nigeria. Just last year a study published in the Journal of Health and Applied Sciences* revealed that of the 420 African workers interviewed for the report 57% did not wear boots/canvas while working on a construction site and 95% had reported puncture wounds to their feet. Enforcing good safety practices is also very low on the agenda of many businesses across Nigeria. It’s an issue close to Halewood Audit Engineer, Samuel Abdullahi’s heart, which is why he is stepping in to help. For the past few months Samuel has been asking Halewood colleagues for their old work boots/shoes in his personal mission to protect the feet of his home nation. A seasoned traveller, Sam was born in Ibadan and grew up in a small town called Warri in Delta state, Nigeria. As a child he saw his town grow and as it did he remembers seeing some of these poor working practices on the many building sites that he walked past each day. Sam said:” We have 5S, work processes, risk assessments and PPE equipment here in the UK. Everything is done as safely as it possibly can. Our constant focus on safety made me remember all those young men and women on building sites in Africa lifting heavy blocks and climbing over rubble with no shoes. 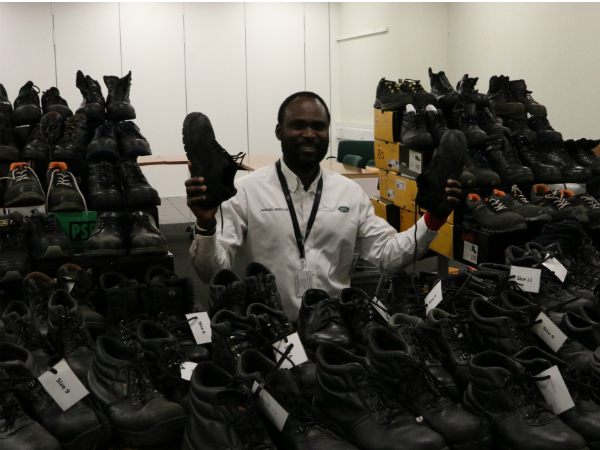 Samuel is collecting boots for a few more weeks so there is still time to hand in your old work shoes/boots and play a part in stamping out bare foot working in Nigeria. Please hand in your footwear to the Halewood HR office on 1st floor Admin Block by March 31 2019.